Welcome to the page of Live Palladium Price Per Ounce. As a palladium investor, it is very necessary to keep track of fluctuation of palladium price. 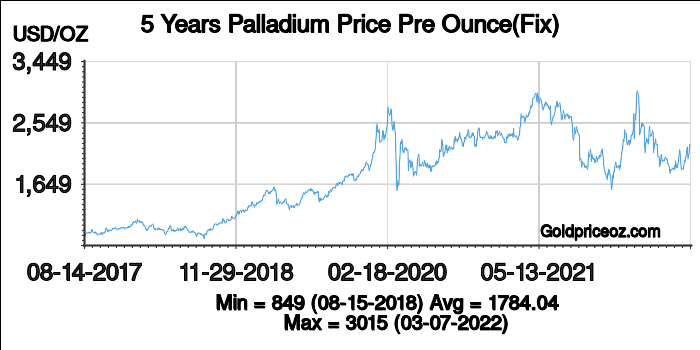 The Live Palladium Price per Ounce provides the palladium price per ounce in real time(including bid price and ask price); it also provides daily palladium price history chart (includes palladium price history charts in different periods). This page is being updated every 1 minutes. 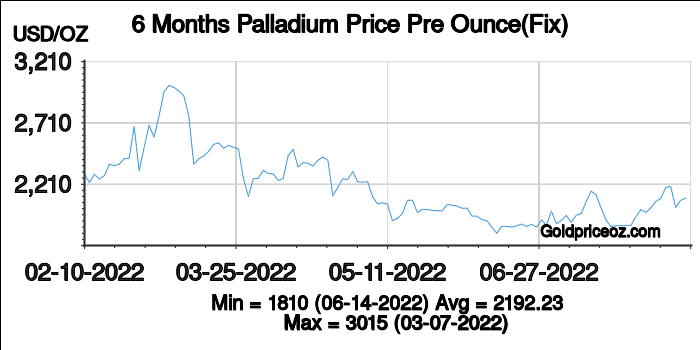 What is the live palladium price, spot palladium price, and palladium fixing price? Live palladium price: also called realtime palladium price, at that price the physical palladium is available for delivery to the buyer and become the buyer's own personal possession. It is not the spot palladium price, or palladium fixing price. Spot palladium price: current palladium price, physical palladium price, affected by the futures price, is calculated according to the most recent average bid price offered by the worldwide professional traders. 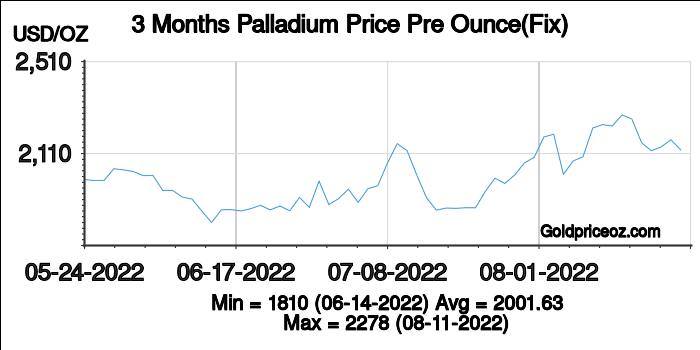 Palladium fixing price: also called London palladium fixing, is a benchmark price for both the palladium and palladium-related goods transactions. It is fixed by five members of the London Bullion Market Association via conference call. 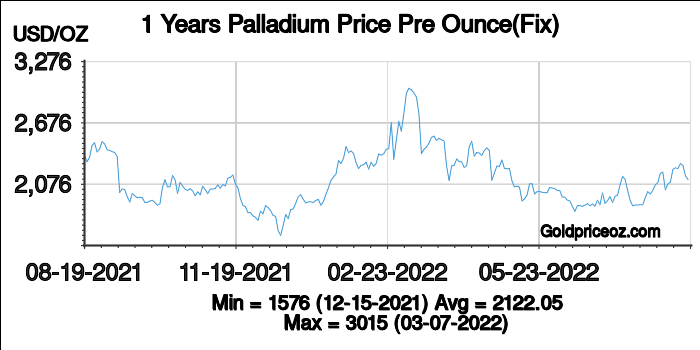 What is the relationship among these palladium prices? These palladium prices have inextricable link, they Influence each other, complement each other. Their fluctuation largely depend on supply and demand. All of them may be as reference prices for physical palladium or palladium futures transactions. 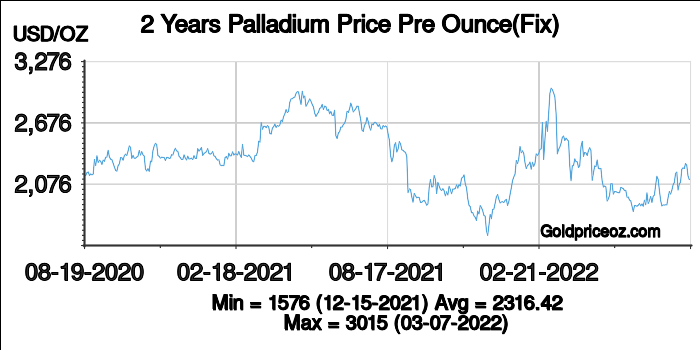 Additional, palladium fixing price is more akin to a momentary spot price (or a momentary live palladium price), that is used among the five major banks' most important customers who sale or buy in multiples of 400 ounces palladium. Whereas, live palladium price is more accurate to keep track on the fluctuation of palladium price in order to maximize your profit and wealth preservation. Compared to above two prices, spot palladium price is much closer the price that you would like to pay for physical palladium.